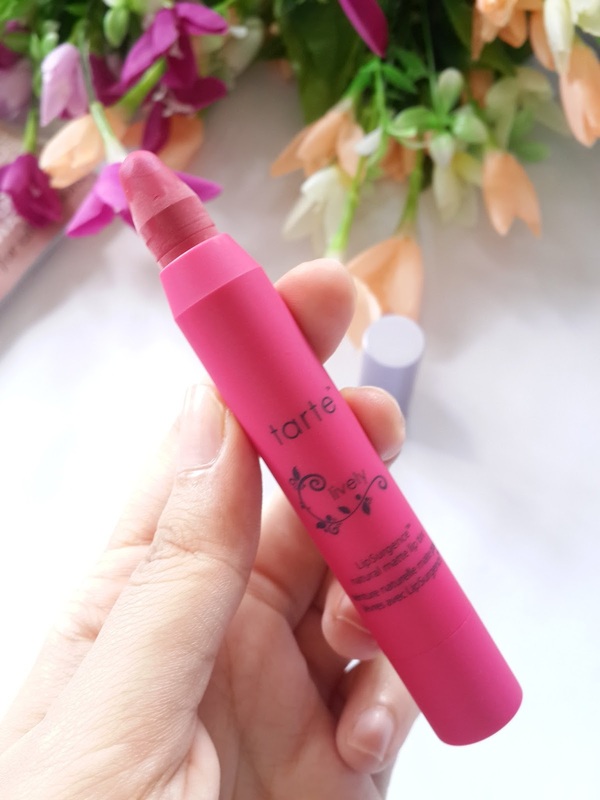 If you love matte lipsticks like me then you definitely gonna love Tarte's Lipsurgence Matte Lip Tint. Okay they really have some amazing shades in this range but out of many I choose only one that is beautiful hot pink shade known as Lively. Its truly a lively shade. What made me buy this lip tint. 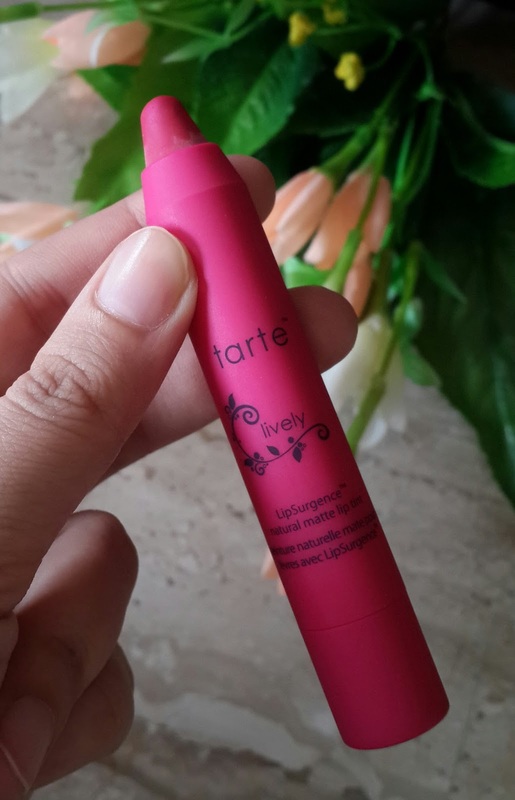 Tarte have great range of Lip surgence products and they still keep on launching new shades in lip tints. They are so popular that I had to get at least one to try it out. This matte ones are again one of the best selling lipstick to have in your everyday routine. 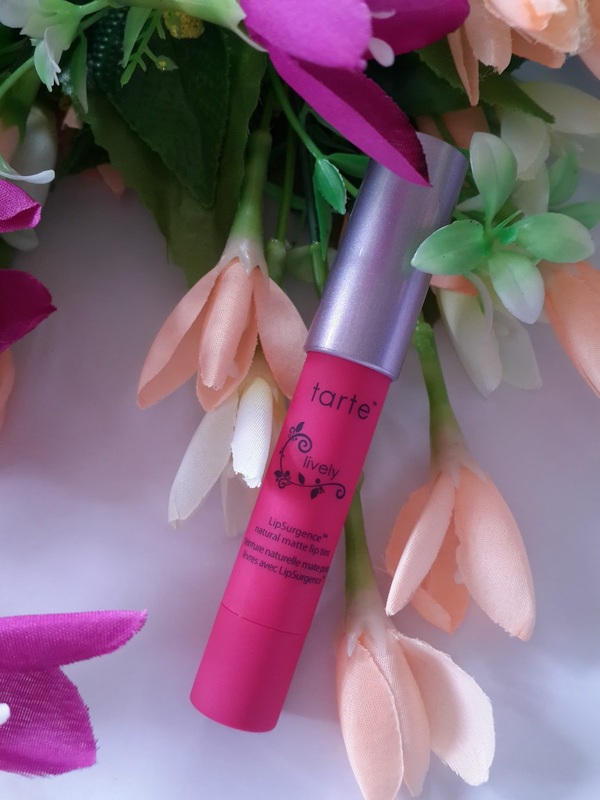 Product claims- Meet your perfect matte - tarte’s award-winning, 3-in-1 lip tint offers the pigmented performance of a lipstick combined with the creamy moisture of a gloss and a rich balm. Infused with skinvigorating™ ingredients like vitamins C & E, this nourishing formula moisturizes and smooths the appearance of lips while delivering natural-looking color with a soft matte finish. Simply twist up the automatic pencil tip and glide it over lips to deliver the ultimate in fashion-matte perfection. It has got skinvigorating ingredients like carnauba wax, vitamin A&E, peppermint oil, coconut and mineral pigments. The moment I swatched it on my hand.I felt in love with this color. Lively is a Hot pink shade first I thought it will be bright bold on lips but it wasn’t, it was subtle more like a rose pink shade giving that velvet matte effect. It felt like every skin tone can carry out this shade. You can use this on everyday basis or for evening look too. I love such lip tints which come in super cute chubby stick packaging and are immensely pigmented. I simply love the idea of this lip tints which has lipstick and lip balm qualities. Well this product claims to be non drying for lips and can moisturise your lips completely. Lets see how it works. Packaging is definitely cute as its in pink matte tube with silver cap. It has a twister below so you don’t need to sharpen them very similar to Clinique Chubby sticks. They have this amazing refreshing smell of peppermint which is not so strong yet it can be felt. 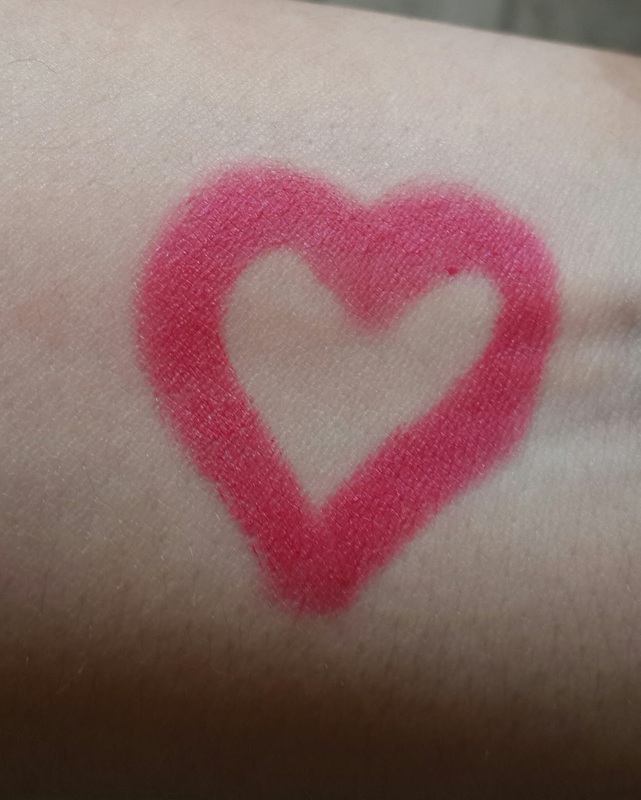 The color of the tube resembles the color inside of lipstick. So if you have many its very easy to identify them without having to search for name or open the cap. The texture is immensely soft and glides effortlessly on lips. One swipe gives you complete coverage in-spite of being matte there is no need of tugging or dragging this lipstick over lips. Pigmentation is excellent. You can definitely build this color without getting uneven application. They feel extremely light on lips and non drying. I am totally impressed with this product. It also claims to increase moisture content by astonishing 6000% after 28 days which I felt is not true. I didn’t find it much moisturizing to lips but still it gives very comfortable velvety matte feel. It doesn’t accentuate lines. After application it does not make your lips dry. But its always better to exfoliate your lips and then use matte lipsticks. It does not smudge OR budge on lips. Staying power the color stays on for 4-5 hrs. It leaves light pink tint on lips. This particular color can go on almost every skin tone. Overall completely recommended it’s a Paraben free product. Something which you can use it on everyday basis. If you are office girl this could be best one to carry they have got pretty nudes too. I am sucker for matte lipsticks and definitely this one is going to be one of my favorite for evening use as they are totally non drying. If you love velvety rose pink shades this one is for you. I would love to get more shades in this. Have you tried any of tarte lipsurgence range? thank you komal !! Ya this one is great you need to have them.